This year mini versions of huge bulky handbags are totally in and I have finally got myself one, 3.1 Phillip Lim Mini Pashli Satchel. It’s so tiny I am in LOVE, perfect for the party season and black goes with everything so I am pretty sorted. 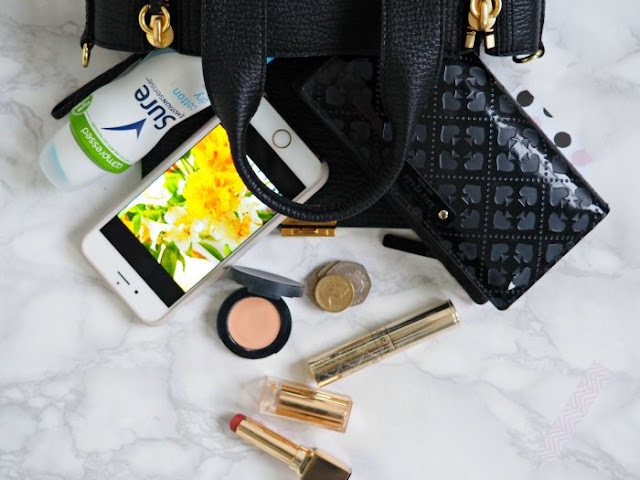 Sure set me the task of living using my mini handbag all weekend and to share the essentials I carry, it’s a hard choice I need products that I cannot live without and that 100% does include a deodorant so the Sure Compressed Deodorant is great. The first thing I started with was to clear out my larger handbag which I always love doing as I find lots of interesting things I have picked up during the week and a few pound coins which is always a great bonus. 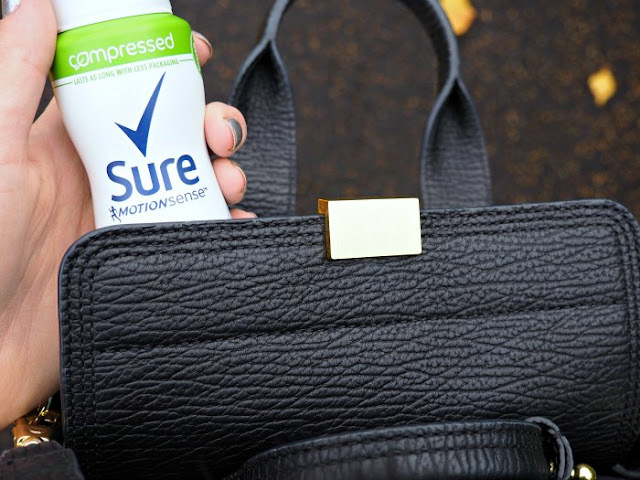 So including the Sure Compressed Deodorant which is 125ml and lasts as long as the larger cans of 250ml which is great because it fits perfectly and great when traveling around London when you need a little spritz. I have also included my Kate Spade wallet if I wanted to scale down even more I could just take out my debit and credit card which has my oyster on it and then my driving license. Although I am 27 I have been questioned about getting my weekly lottery ticket so the ID is a must. I also threw in a few pound coins from in my larger handbag. My mobile phone is a definite as there is no way I was leaving this behind something might happen on Instagram!! and with v-logging my Olympus Pen is also an essential now. I usually don’t top up my makeup during the day so all I need is some concealer, this one is a newbie from Bare Minerals SPF 20 CorrectingConcealer in light 2 it’s a creamy texture with pinky tones and it goes so well with my skin tone. Although I do not top up my makeup, lipstick is a part of me and I must wear it at all times J and at the moment my favourite colour is plum like this Clarins matte number in RougeEclat in Tawny Rose. You can build up the lip colour for a deeper shade which is perfect as you go into night mode. After using my mini handbag for a whole weekend, it felt really refreshing to scale back, you don’t need non essentials!